Our clients desired to live in a home that enabled them to 'live long', requiring single level living, full accessibility and amenity, and a celebratory aesthetic. Sitting at the end of the ridge atop Coal Point peninsula, the original 1950s red brick dwelling commanded attention from its elevated aspect, but lacked street presence with drab landscaping and a tired appearance. We saw past this, quickly identifying the fantastic passive design, solar orientation and extensive view opportunities across Lake Macquarie afforded by the excellent siting of the house. By retaining and extending the existing open plan to thereby create a more flexible home for living and entertaining, the house was extended into two new loggia which straddle the central living space and create the dominant aesthetic of the building. Inside, the spaces are warm and bright, with the more private areas of the house drawn to either end of the flexible, generous living spaces. 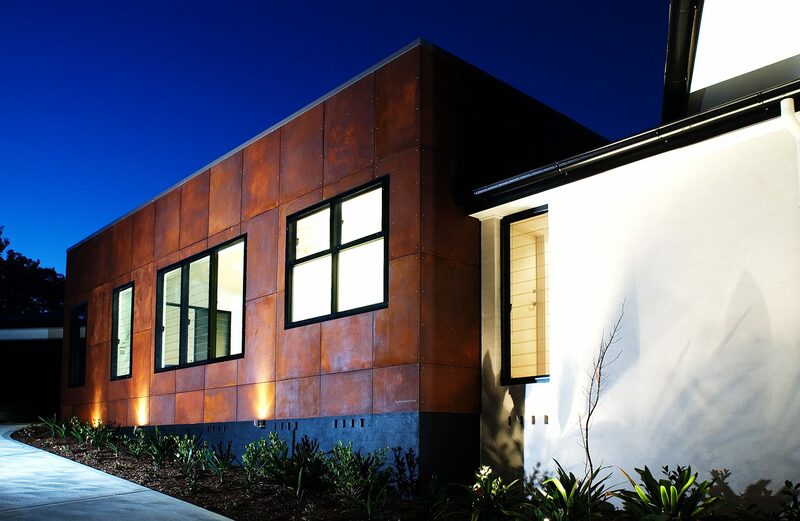 We collaborated with Axolotl on the rust finish custom wall panels, contrasted by the lime green FC cladding of the pop-out robe, furnishing the house exterior with an undeniable vibrancy and personality. In contrast, the painted brickwork becomes an abstract, flowing connector of the materials and forms with the physical realities of the site. Service spaces have been zoned to suit the public and private functions of the house, with an open plan kitchen facing into the lounge and dining areas. The ‘green theme’ is boldly inserted throughout the dwelling interiors, gracing benchtops, tiled surfaces, and interior walls as a joyful counterpoint to the minimalist joinery fitout and moody rust finishes.